Yeti or the Abominable Snowman is a mysterious creature, supposed to be living up high in the Himalayas , around the Nepal Tibet border. Yeti, in Tibetan means "Magical Creature" and that certainly seems to be the case as it's very rarely seen. Some believe the Yeti to be an Intra-Dimensional Being making it's way through portals or time warps. It's been mostly associated with myth or legend like the ET or the UFOs due to lack of sufficient evidence, however in the recent times there have been breakthroughs in this quest yielding footprints of what experts believe to be the legendary Himalayan Yeti ! 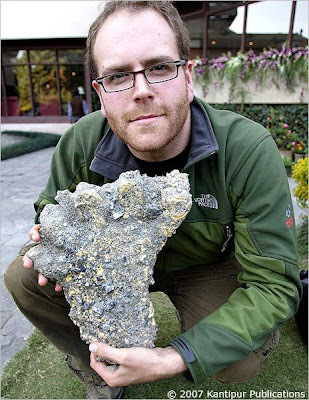 In the picture above, Josh Gates, along with a team of American explorers and TV crew found this ‘mysterious Yeti-footprint’ at Manjushree near Mt.Everest in early November, 2007. The first reliable report of the Yeti appeared in 1925 when a Greek photographer, N. A. Tombazi, working as a member of a British geological expedition in the Himalayas, was shown a creature moving in the distance across some lower slopes. The creature was almost a thousand feet away in an area at an altitude of around 15,000 feet. Yeti reports usually come in the form of tracks found, pelts offered, shapes seen at a distance, or rarely, actual face-to-face encounters with the creatures. Face to face encounters never come with researchers looking for the Yeti, but with locals who stumble into the creature during their daily lives. Some of the best tracks ever seen were found and photographed by British mountaineers Eric Shipton and Micheal Ward in 1951. They found them on the southwestern slopes of the Menlung Glacier, which lies between Tibet and Nepal, at an altitude of 20,000 feet. Each print was thirteen inches wide and some eighteen inches long. The tracks seemed fresh and Shipton and Ward followed the trail for a mile before it disappeared in hard ice. Some scientists that viewed the photographs could not identify the tracks as from any known creature. Others, though, felt it was probably the trail of a languar monkey or red bear. They noted the tracks in snow, melted by the sun, can change shape and grow larger. Even so, the bear/monkey theory seems unlikely as both of these animals normally move on all four feet. The tracks were clearly that of a biped. Shipton’s and Ward’s reputations argue against a hoax on their part and the remoteness and height of the trail’s location argues against them being hoaxed. Shipton’s footprints were not the first or last discovered by climbers among the Himalayas. Even Sir Edmund Hillary and his Sherpa guide, Tenzing Norgay, on their record ascent to the top of Mount Everest, in 1953, found giant foot prints on the way up. One of the more curious reports of a close encounter with a Yeti occurred in 1938. Captain d’Auvergue, the curator of the Victoria Memorial in Calcutta, India, was traveling the Himalayas by himself when he became snow blind. As he neared death from exposure he was rescued by a nine foot tall Yeti that nursed him back to health until d’Auvergue was able to return home by himself. In many other stories, though, the Yeti hasn’t been so benign. One Sherpa girl, who was tending her yaks, described being surprised by a large ape-like creature with black and brown hair. It started to drag her off, but seemed to be startled by her screams and let her go. It then savagely killed two of her yaks. She escaped with her life and the incident was reported to the police, who found footprints. Several expeditions have been organized to track down the Yeti, but none have found more than footprints and questionable artifacts like scalps and hides. The London Daily Mail sent an expedition in 1954. American oil men Tom Slick and F. Kirk Johnson financed trips in 1957, 58, and 59. Probably the most well-known expedition went in 1960. Sir Edmund Hillary, the same man that had first climbed Everest in 1953, lead the 1960 trip in association with Desmond Doig. The expedition was sponsored by the World Book Encyclopedia and was well outfitted with trip-wire cameras, as well as time lapse and infrared photography. Despite a ten-month stay the group failed to find any convincing evidence of the existence of the Yeti. The artifacts they examined, two skins and a scalp, turned out to belong to two blue bears and a serow goat. At the time Hillary and Doig wrote off the Yeti as legend. Later, though, Doig decided that the expedition hadbeen too big and clumsy. They didn’t see a Yeti, he agreed, but nor did they observe such animals like the snow leopard which was known to exist. After spending thirty years in the Himalayas Doig believes that the Yeti is actually three animals. The first is what the Sherpas call the “dzu teh.” Large shaggy animals that often attack cattle. Diog thinks this is probably the Tibetan blue bear. A creature so rare it is known only in the west through a few skins, bones and a skull. The second type, called “thelma,” is probably a gibbon (a known type of ape) that Diog thinks may live as far north as Nepal, though it’s never been spotted past the Brahmaputra River in India. The third Yeti, “mih teh,” is the true abominable snowman of legend. A savage ape, covered with black or red hair that lives at altitudes of up to 20,000 feet. Yeti Documentary : Destination Truth " The Yeti "